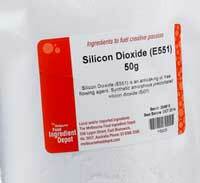 (Nanowerk News) The anticaking agent E551 silicon dioxide, or silica, has been used widely in the food industry over the past 50 years, and was long thought to be quite safe. Now, however, researchers working on the National Research Programme “Opportunities and Risks of Nanomaterials” have discovered that these nanoparticles can affect the immune system of the digestive tract. It ensures that dry foods such as instant soup, instant coffee and spice powder retain good flow properties. “Synthetic amorphous silica”, the ultrafine powder which is obtained from quartz and bears the E number E551, has been used for around a century with no apparent cause for concern. “Previously it was assumed that these nanoparticles are completely inert,” explains Hanspeter Nägeli from the Institute for Pharmacology and Toxicology at the University of Zurich. Now, however, Nägeli and his colleagues working on the National Research Programme “Opportunities and Risks of Nanomaterials” (NRP 64) have found out that these nanoparticles are capable of activating certain immune cells. “We have demonstrated that inactive dendritic cells are stimulated in response to contact with nanosilica, triggering a reaction similar in nature to an inflammation,” says Nägeli. Their findings (Particle and Fibre Toxicology, "MyD88-dependent pro-interleukin-1ß induction in dendritic cells exposed to food-grade synthetic amorphous silica") are piquing interest, since dendritic cells have a key role to play in the immune system of the gut: They maintain a dynamic balance between peace and war, or defence and tolerance reactions. Dendritic cells are significantly involved in the immune system’s fight against toxins and pathogens. Moreover, they coordinate the body’s favourable response to food components or agents of normal gut flora. In a further publication (Journal of Nanobiotechnology, "Critical review of the safety assessment of nano-structured silica additives in food"), Nägeli directs criticism towards the current safety assessment of nanosilica. “The toxicology analyses list no immunological criteria.” In addition, tests involving the addition of particles to rat food have shown liver damage in the highest dosages, although this was not taken into account in the risk evaluation. While no link with nanosilica has apparently been proven, one cannot be excluded, given current knowledge. “For this reason, we ask a principle of caution to be exercised, and for the tolerance level in food to be reexamined,” says Nägeli.